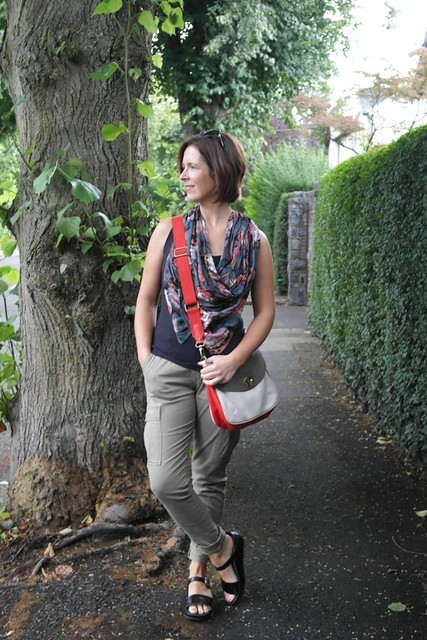 Holding off buying the Hush Cargo Pants back in July paid off as they were further reduced from £40 to £20 last week! Unfortunately, all the sale stock is gone from the Hush site now but it's worth a look to see what's coming in for AW14. It will make you excited to wear ankle boots and jumpers again. But back to my bargain new trousers...I sized down to the 10 and they fit well and are a welcome change from my constant denim jeans lately. So the black & khaki looked a bit plain but it was too warm for a jacket or a large scarf and then I remembered that I had this cute cotton square scarf I'd picked up brand new from the charity shop last year. It was in a cute presentation box with tags still attached and I loved the colours..even though I wasn't sure how to wear it. 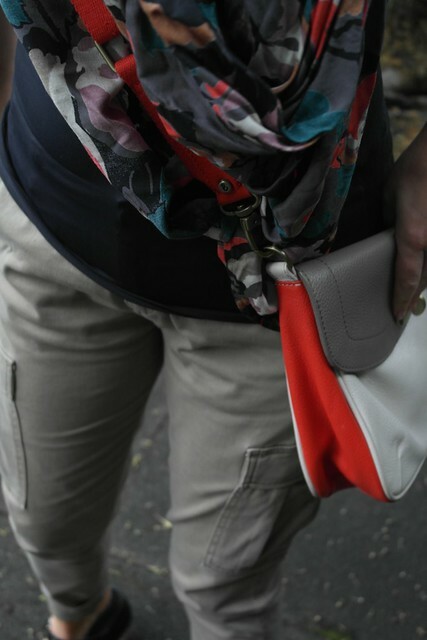 You see square scarves are tricky to tie but they're amazing to wear draped like this. 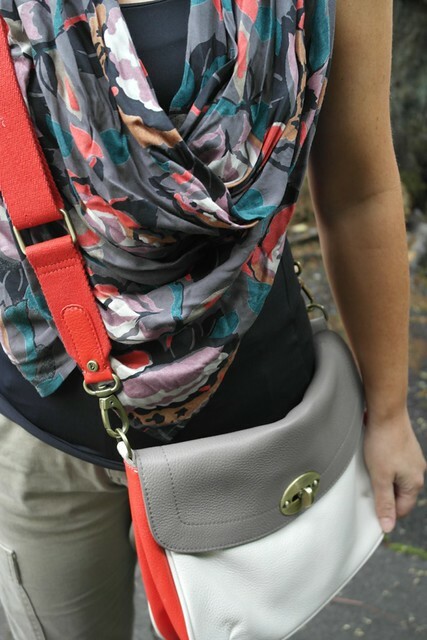 Simply tie a small knot with opposite corners and hang it round your neck. It was just perfect to take the bare look off and as the Zara tops are quite tight, it meant I wasn't as conscious of the mum tum (much neglected since my back injury). You might remember that I bought this bag last year in the Boden summer sale but returned it as I felt the colour combination was limiting. But then one night recently, I spotted a once worn one on eBay (it's boring having a bad back) and as I'd loved the shape and size of it, I thought I would keep an eye on the listing and luckily I was the winning bidder. For a bargain £20 including postage. Picked a few of my favourites from the Hush AW range on these montages. I'm loving looking at all the new season stock and will be sharing bits and pieces I'm liking the look of from some of my favourite brands over the next few weeks. Because we've had such a lovely summer, I'm ok about the weather turning cooler and looking forward to digging out the cosy stuff again. Have a great day..oh and before I go, I'm having a flash sale on all my summer scarves on this link - 2 for £10/4 for £20/6 for £30 as I'm making room for my own AW14 stock. These scarves won't be back in stock again and two thirds of the stock is already sold out so don't delay! 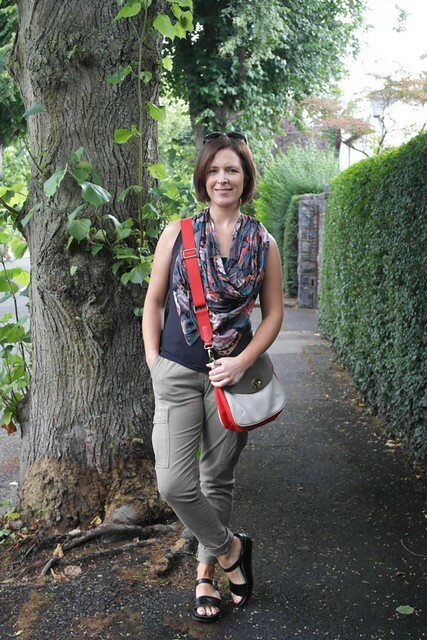 The cargos logo great on you, and a good alternative to jeans, love the scarf tip. Oh that Hush yellow sweater with boyfriend jeans looks amazing. Just gorgeous. Lucky you re the trousers, meant to get some myself!